Compilation film in five episodes of the Indian forces on the Western Front, Mesopotamian Front and Palestine Front, 1915-1918. I. 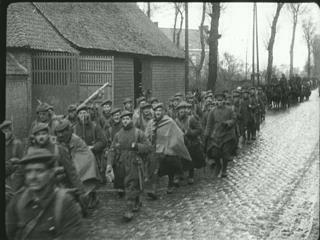 The first reel shows men of the Indian Corps (including British soldiers) in France in January 1916. It is taken unaltered, in a slightly re-edited form, from IWM 202 INDIAN TROOPS AT THE FRONT. II. The middle three reels show scenes of Mesopotamia 1917-1918. Although Indian soldiers appear in the film it does not in any way single them out or emphasise them above British soldiers or the events of the campaign. The material is taken directly from the series ADVANCE OF THE CRUSADERS INTO MESOPOTAMIA. III. The last reel shows scenes of Palestine in 1918. Although Indian troops are shown, mainly from 7th (Meerut) Division, they are in no way given special prominence. The material is taken directly from IWM 30 ALLENBY MEETS WEIZMANN - TEL-EL-JELIL AND ARSULF. Military conflict took place during every year of the 20th Century. There were only short periods of time that the world was free of war. The total number of deaths caused by war during the 20th Century has been estimated at 187 million and is probably higher. The First World War ended - but it did not mean an end to fighting in Europe. Discover why German sailors sunk their own ships in 1919.